A group of archaeologists and multi-discipline scientists from Armenia, USA and other countries have unearthed an ancient winery in a spectacular large cave near Areni village, 7 km far from Noravank monastery, 90km from Yerevan, south Armenia. This old winery has been used for stomping grapes, fermentation and storage vessels, drinking cups, and withered grape vines, skins, and seeds. According to Armenian and US scientists these findings are the oldest and the most reliable evidence of wine production on the Planet dating back 6100 years. It is the first time that a complete archaeological site of wine production is discovered. Day ½: Arrival, meet and greet. Yerevan – City tour – Matendaran – History Museum – “ARARAT” Wine and Brandy Factory Meet and greet. Hotel accommodation. Breakfast at the hotel. Note: 1st and 2nd day activities will be adjusted according to the itinerary of the group. City Tour around Yerevan- the capital of the Republic of Armenia. Having a history of almost 2800 years, Yerevan is a modern city with high rise buildings, nice cafes and parks. It’s a combination of reach history and a modern lifestyle. Yerevan City was originally designated so that it overlooked the biblical Mount Ararat, and indeed the Holy Mount can be seen from every corner of the capital. You will see all major sights of the capital including Opera house, Republic Square, Kievyan Bridge, Baghramyan Avenue, the Presidential Palace, Academy of Sciences, National Parliament as well as “Cat statue” by famous sculptor Fernando Botero at the Cascade area; enjoy the panoramic view of Yerevan etc. Visit Matenadaran (http://www.matenadaran.am) – is an ancient manuscript repository located in Yerevan, Armenia. It holds one of the world’s richest depositories of medieval manuscripts and books. Visit “ARARAT” Wine and Brandy Factory. Today it’s on the most famous and successful brand in Armenia as well as worldwide. 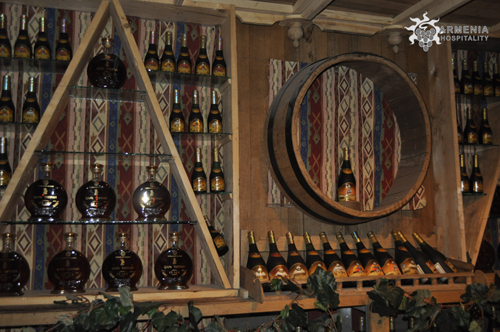 ArArAt has been preserving the traditions of brandy production since 1887. 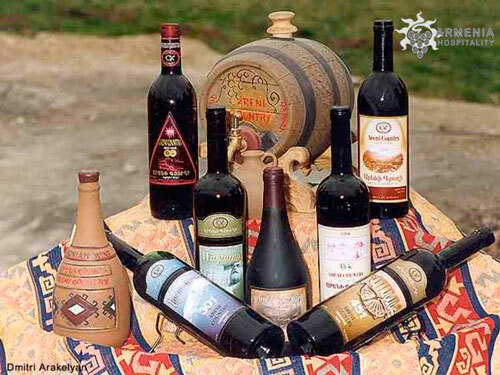 Only local varieties of grape with special properties are used in the production an authentic Armenian brandy, based on the unique microclimate of the Ararat Valley. Lunch. Visit the History Museum where artifacts and items from prehistoric time to our days tell us the reach history of the land and its people. Free time when you can enjoy Yerevan lifestyle with evening and night life activities. Catolicos of all Armenians. Continue to the UNESCO World Heritage Site of 7th century, the prominent work of Armenian architecture the Temple of Zvartnots. Lunch. Departure to the Wine and Brandy Factory “Noy-Ararat”, the official supplier of the Kremlin. Dinner at a local restaurant. 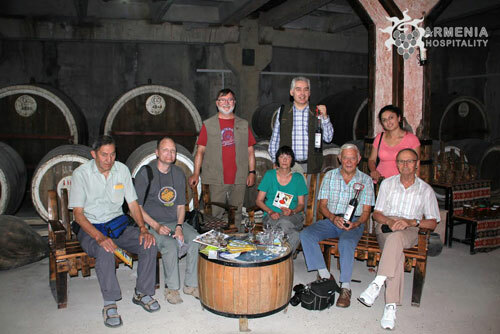 Day 4: Yerevan – Sevan – Dilijan – Haghartisn – Ijevan -“Ijevan” Wine Factory and tasting of local wines. Breakfast at the hotel. Departure to the pearl of Armenia- Lake Sevan. Visit to the 9th century monastery situated on the peninsula of Sevan. Proceed to the Monastic complex of Haghartsin. Lunch. Departure to the town of Ijevan to visit the “Ijevan” Wine Factory and tasting of local wines. Drive back to Yerevan. Overnight in Yerevan. Day 5: Yerevan – Khor Virap – Noravank – Areni -“Areni” Wine factory. Noravank, situated in a breathtaking site, on the brick-red cliffs of the deep canyon. Dinner at a local restaurant. Drive back to Yerevan on the way visit “Areni” Wine factory to taste local wines made of grapes growing in Ararat valley. Dinner and overnight in Yerevan. Day 6: Yerevan – Saghmosavank – Hovhanavank – Karmravor – Oshakan -“Oshakan” Wine factory. Breakfast at the hotel. Departure to the region of Aragatsotn and visit to two outstanding works of Armenian architecture, the monastic complexes Saghmosavank and Hovhanavanq, both situated on the deep canyon of Kasakh River. Continue to one of the ancient town of Armenia, Ashtarak to visit 1 of the smallest churches on the territory of Armenia, the 7th century Karmravor, which has undergone very few changes during these long centuries. Lunch. Continue to the village of Oshakan to visit “Oshakan” Wine factory and taste local wines. Visit to the Church of Oshakan, in which St. Mesrop Mashtots, the inventor of Armenian alphabet is buried. Return to Yerevan. Visit Vernisage – open-air handicraft market where you can buy souvenirs in remembrance of your trip to Armenia. In the evening-Farewell party dinner at traditional Armenian restaurant with live music and performance.